Installation with reel to reel tape recorders. 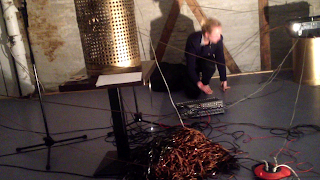 The machines were recording the sound of themselves, transporting the sound around to each other and playing it back. The recorded sound ended up in a pile on the floor.